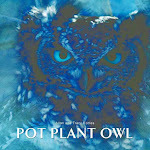 Pot Plant Owl: 15 Aug and what a mess! 15 Aug and what a mess! I'm not happy. After hours of painstakingly scrubbing the balcony and tidying everything up for Pot Plant Owl's imminent arrival, the balcony looks like a bomb has hit it. The mess created cannot be the result of two owls less than a kilogram each in weight. Oh no! This mess must surely have been created by a herd of elephants trampling everything in their path. We woke this morning to find soil scattered all over the balcony floor. Twigs, leaves and small bones lay in disarray. Soil spilling out of all three pots. If I didn't know better, I'd assume that Pot Plant Owl and Pappa had friends over last night for a party. Just when we thought Spring had sprung, a cold snap moved in yesterday. This is likely to push back PPO's nesting 'schedule' a bit. I can almost hear her now! Maybe they consider that 'lived in and homey', and are upset when it is 'too clean'? LOL! Looking forward to their return!